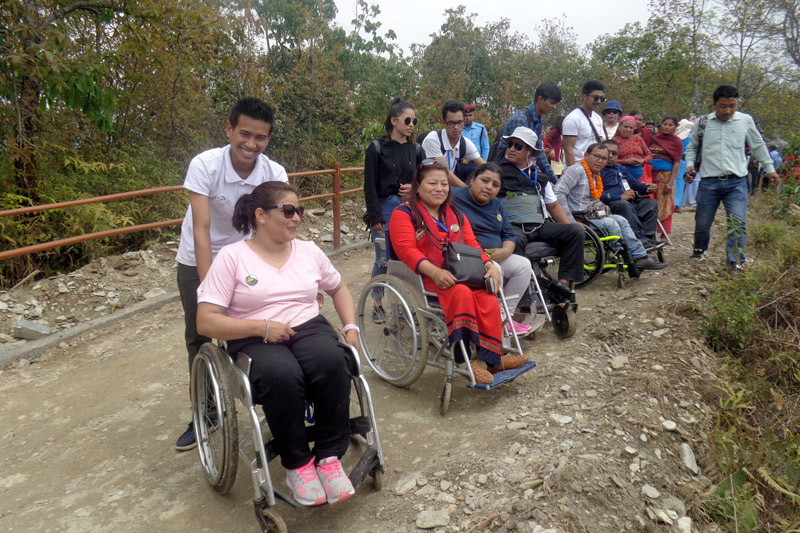 Asia's first handicap accessible trekking route nearby Pokhara comes to an operation. Minister for Culture, Tourism and Civil Aviation Rabindra Adhikari inaugurated the route amid a programme organized in the Capital on Saturday. The 1.3-kilometres route was developed with the financial assistance of Nepal Tourism Board and people’s voluntary labour. The trail is a section of popular hiking route Sangarkot to Naudanda offers the magnificent views of Mt. Annapurna, Fishtail and Manaslu along with glimpses of panoramic views of valleys. on the occasion, the disability people passes through the trekking route form Bhumeko Thaan to Himalayan Deurali resort in Wheel chair and white canes.